So wrote Alexander Hamilton in Federalist no. 79 in 1788. In pointing to the need for an independent judiciary, Hamilton stressed that the president and members of the judiciary could only be truly independent if they did not have to rely on Congress for their paychecks. Without this independence, the other two branches of government would simply become puppets of the legislative branch. Hamilton was right, but why stop there? If placing the livelihood of some in the hands of others creates a structural problem within the government, then yoking the immediate financial interests of citizens to the government would cause much the same problem without. Just as the executive and judicial branches would be bought and paid for by the legislature, the entire citizenry would become nothing but vassals of the state. This is exactly what came to pass in the twentieth century. As the size and scope of government ballooned, so too did Americans’ dependence on it. And a disastrous synergy was born. Citizens demanded ever more from the government, and politicians obliged, steadfastly refusing to balance the budget in the bargain. Instead, the government borrowed what politicians needed to keep the people fat and happy. It ran up $19 trillion in official debt, or (conservatively estimated) $120 trillion including unfunded liabilities (think promised future Social Security and Medicare benefits). 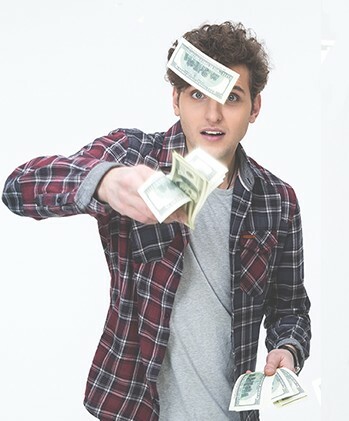 Equal parts debt and dependence resulted. The federal debt is simply the accumulation of annual deficits. How bad have these annual deficits become? Figure 1 shows the inflation-adjusted per-capita deficit. In the 1960s, the deficit averaged $200 per year per person (in today’s dollars).This number tripled to more than $750 in the 1970s, then more than doubled again to over $1,600 in the 1980s. It held constant in the 1990s, then increased by 50% in the 2000s and again in the 2010s. 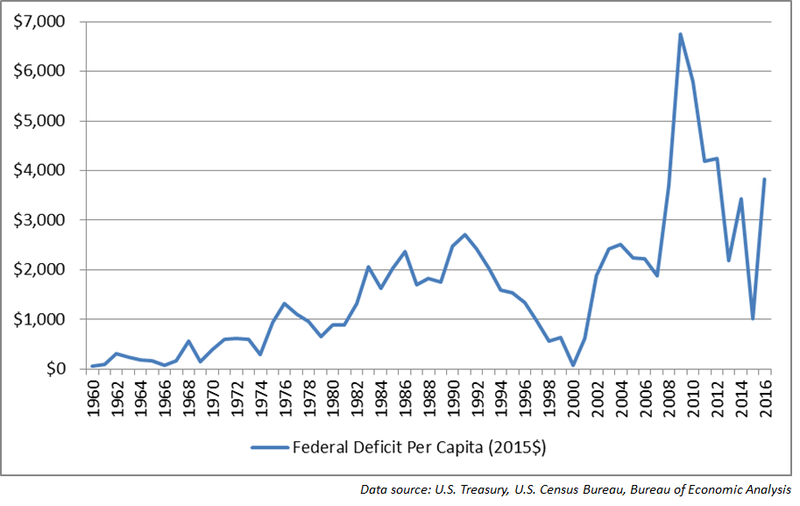 Adjusted for inflation, the annual deficit per person today is almost seventy times what it was in 1960. And what is the government doing with all this spending? It’s buying off voters in two ways. First, the government buys off today’s voters with tomorrow’s voters’ money. Tomorrow’s voters will pay for today’s deficits through increased taxes, reduced government services, or inflation resulting from monetization of the federal debt. Second, the government buys off the majority of voters with the minority’s money. According to the Congressional Budget Office, only the top 40% of taxpayers (on average) pay more to the federal government than they receive back in the form of tax credits and transfers (figure 2). This means that a majority of Americans—almost a supermajority—have a personal interest in expanded government. The more government spends, the more they stand to receive. In the end, politicians buy dependence with money the government does not have. This is doubly destructive, because it chains dependent citizens to a ship that is slowly sinking. 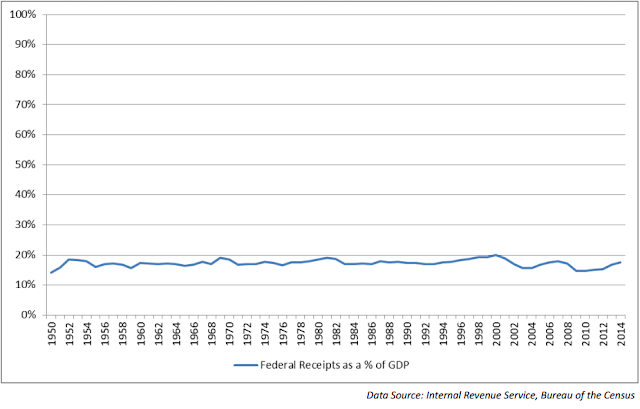 “How much government” can be measured by federal receipts (all federal government revenue) as a fraction of GDP. This ratio measures the fraction the government takes of value the economy creates. It is a reasonable measure of the government’s “footprint” on the economy, and the government’s footprint has remained remarkably constant for a long time. 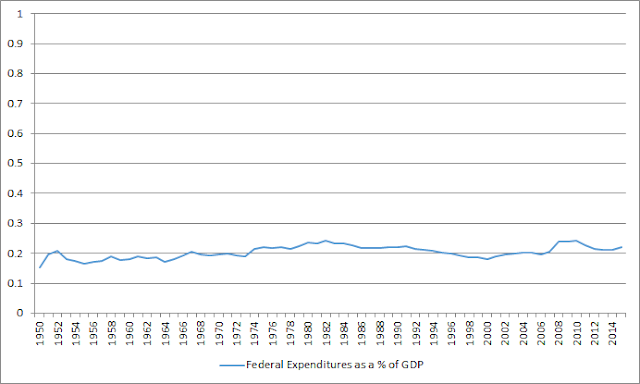 Figure 3 shows federal receipts as a fraction of GDP from 1950 to the present. Over this period, the ratio has averaged 16.9%, with a low of 13.1% in 1950 and a high of 19.7% in 2000. What’s noteworthy is that the ratio has remained relatively stable despite wide fluctuations in tax rates. Over this period, the top marginal income tax rate fluctuated from a low of 28% in 1988–89 to a high of 92% in 1952–53. Social Security and Medicare tax rates fluctuated from a low of 1.5% in 1950 to a high of 15.3% from 1990 to the present. The top capital gains tax rate fluctuated from a low of 15% from 2003–7 and 2010–12 to a high of 39.9% in 1976–78. The average effective corporate tax rate ranged from a low of 20.2% in 1985 to a high of 45.3% in 1960. Finally, the estate tax rate moved from a high of 77% from 1950–76 to a low of 0% in 2010. Despite the rhetoric, government can neither raise nor lower taxes. Government can only raise or lower tax rates. Taxes are what emerges when the government applies tax rates to economic activity, and economic activity is controlled by individual people. How much government is possible? The answer seems to be 17% of the economy. That’s all the revenue the economy appears willing to deliver. But the government can control spending. While the government has collected a relatively constant 17% of GDP, it has spent a relatively constant 20% of GDP, as figure 4 illustrates. In other words, the government consistently chooses to spend more than it can take in, to the tune of about 3% of GDP. In any given year, the government spends about 15% more than it should. Since 1958, federal receipts have only been large enough to support the size of government we had eight years prior. Cutting spending to match the 17% of GDP the government collects every year is the first step. The second step is addressing the near supermajority of Americans who receive more from the government than they pay in. The present trajectory is both unreasonable and unsustainable. The solution could be quite simple. About 15% of Americans live below the poverty line. It is wholly reasonable that these people receive more, perhaps significantly more, than they pay in. Another 35% are above the poverty line but below the median income. These people should neither pay nor receive anything. Finally, 50% are above median income, and these are the people who should pay more than they receive. Taking one of these steps without the other is pointless. Hamilton was right: the power of a man’s subsistence is power over his will. And where citizens are concerned, this is a dangerous thing. It is so dangerous that it has resulted in a crushing debt that will cripple, if not annihilate, the United States in the coming years. Citizens who want things at no cost and politicians who want to dole those things out in exchange for votes will have to put their short-term interests aside if they have any desire to keep their republic. Antony Davies is associate professor of economics at Duquesne University in Pittsburgh. James R. Harrigan is director of academic programs at Strata in Logan, Utah. Article shared with ARRA News Service by the Intercollegiate Studies Institute. Tags: Government Debt and Spending, 4 Graphs, Antony Davies, James R. Harrigan, Intercollegiate Studies Institute To share or post to your site, click on "Post Link". Please mention / link to the ARRA News Service. and "Like" Facebook Page - Thanks!